Is Money the Only Measure of Success? During this time of year, I tend to reflect upon my accomplishments and goals. I make note of what I did well and what I need to improve going forward. Last year was challenging. I lost my Mom after a six-month illness and struggled with sadness, loss and emptiness due to her passing. One-year later, I still feel her presence in my life every day. As the new year begins and I’m updating our personal portfolio and other investments that I manage, I wonder, “Is Money the Only Measure of Success?” After all, my Mom amassed a certain degree of financial success, yet she was so much more than her net worth. Actually, I struggle to separate my worth from my net worth! Look, I understand we all espouse a variety of success measures. Yet, I remind myself to consider all of my qualities, not just those related to money and financial matters. I’m certain that I’m not the only one pondering whether money is the only measure of success. But do you overweight financial success? 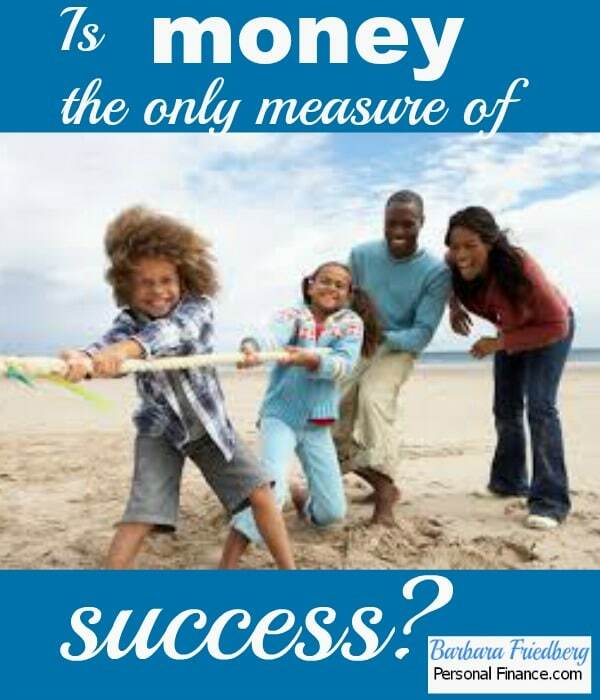 Is money the only measure of success for you? Consider how you define success and ask yourself if it’s helpful. Do you think those who earn more are more successful? Believing that money = self worth is common in western cultures. This belief is difficult to escape. Yet, is it really true? After earning, saving and investing enough to meet your basic needs, there’s little evidence to suggest that more money equals greater happiness. There are unhappy millionaires along with content and fulfilled lower income workers. In fact, I write about this very topic in secrets of the super rich. On occasion it’s useful to look inside ourselves. Do you spend time in self reflection? Do you try to live in accord with your personal values? For example, which is more important; planning a fun day with your family at a local park or event or spending that day working to earn extra income? There’s no correct answer. This is a decision I struggle with all of the time. I love to work and I value earning extra money. Yet, spending time with my family is the most important activity for me. But, sometimes my actions don’t match up with my values. It’s certain that time is finite. Once it’s gone, there is no more. I lost my dad a few years back, and seeing him during the last few years of his life drove this concept home. Couple that with the fact that no one knows how long they will live, and these realities underscore the importance of spending your time fruitfully. I don’t have the answer to whether money is the only measure of success nor what is the best use of one’s time. I resolve it by attempting to balance work, leisure, time with family, and time on hobbies. I’m certain that this balancing act confronts most adults. In fact, just a few minutes ago I found an email in my inbox from Darren Rowse of Problogger fame offering a new book with the title Blog Wise: How to do More with Less. Although tempted to purchase, I realized there really is no secret message for productivity and success. Yet, returning to the beginning of this story – while updating our portfolios I began to mentally project some of our annual income and realize that we have enough. Yet, how much is enough? Is the marginal time spent earning a few extra bucks more important than a precious afternoon with my family? Personally, after a certain level of income is reached, the answer is; the best use of my time is to spend the time with my family! Yet this question also relates to your age and stage in life. If you’re looking to buy a house, maybe working that second job is really important right now. Or maybe you have a ton of debt and are determined to get it paid off. Then every extra cent earned is important. There are so many ways to measure success, and yes, money may be one of those ways. Yet the pursuit of an answer to, “How do you measure success?” is multifaceted. The happiness research intertwines the importance of finding your purpose in life, having control, and making a contribution. Does that mean that those who are happy are successful? Happiness is a fleeting emotion. No one is happy all the time. And realistically, success might not be directly correlated with money or wealth. Think about the single mom social worker with a few kids. It’s unlikely she’s swimming in extra cash, but she is definitely making a contribution to the betterment of society. If she helps place a child in a good home, she’s a true success. What about the community volunteer, donating her time and working for the betterment of society. He’s definitely a success. The mom who coaches the kids soccer team and the dad who helps with homework each night are successful within the family and helping the greater good. Is Donald Trump more successful than Mother Theresa? In a broader sense, every job makes a contribution. And doing one’s job enthusiastically and competently can make you a success in any area. Society needs successful trash collectors, school teachers, accountants, and plumbers. When a pipe bursts, you value and appreciate a plumber more than a highly paid company president or wealthy movie actor. Before you mindlessly dive into your next activity, think about the things you do that make your life successful. Don’t worry about what anyone else is doing. Realize what more money can and can’t do. Money can buy things and experiences, but it can’t buy relationships. Learn to get rid of financial worries, so you have more time for what really matters. How do you measure success? Do you value money over other factors? Money is far from the only measure of success and it’s the wrong question for most people but they can’t break out of the influence of media, society, friends and family. The values that you put up are still ones imposed by society as well. It’s more important to define success for yourself. The definition of success will also change with time and you need to flexible to accept it. For me, success is having enough money (and using it wisely enough) to allow MORE time with loved ones. My job (freelance writer) is portable, so I’m able to visit family/friends whenever I want — as long as I get my work done, and as long as I have enough money to buy plane tickets without worrying about the bottom line. That’s where the “wise use” comes in. The bottom line also includes saving for retirement and having a decent emergency fund. Again, being careful with my money lets me do both while still going to see my dad (I’d rather go for a visit than a funeral, if you know what I mean), hanging out with my daughter (who lives a bunch of states away now instead of in the same apartment building) or spoiling my great-nephews (aka surrogate grandkids). Still haven’t quite figured out the work-life balance, but I value the struggle. I would call Gandhi pretty successful though he himself had little wealth! @Kim, Thank you for bringing in the influences of the omnipresent media. It’s sometimes quite a challenge to rely on one’s own true beliefs while living within this consumerist society! @Donna, Your point about valuing the struggle really struck a chord. The journey of life is so much richer than arriving at the destination. You clearly laid out an ideal response to the “success and money” conundrum. @moneycone-I strive to be more like Ghandi, but, I think I’d have to be reborn to even come close. Success is the attainment of a goal. It may be different for a parent, clergy or accountant. Two out of three has nothing to do with money. What is enough money is very subjective and difficult to answer because it is individual. Money plays a partial part of success and that greatly depends on how you can get it. There was a guy here in my home state of Michigan that won over 2 million dollars in the lottery. He was featured on that TLC “lottery changed my life” show. I hate to be mean, but this guy was about as dumb as they come. Well to find out, he blew all his money on fireworks, bad investments and is now in jail because of drugs. I think everyone has their own view of success. To me, it’s someone that contributes to society, doesn’t leech on the government, has great morals and donates from time to time. I think that our culture predominantly values money as a sign of success…and it is hard to walk away from this measurement. I struggle with it myself! @Krantc-I like your example of how various types of folks will likely view success. @Hannah-There’s data that explains that many lottery winners end up bankrupt. I am chuckling at your depiction of the winner. In his case, money certainly didn’t make the lottery winner a success. @Amanda, It’s tough to swim against the tide! Along the Gandhi line there are other very successful folks who not only had no money of their own, but recommended you get rid of yours as well. Jesus Christ and Buddha come immediately to mind. We are living on an income of $2000/mo (voluntarily) in our dream country. We may not be money rich, but we are happiness rich. Would that qualify as success? I’m not sure, but if not then I’ll settle for happiness over success. One of the hardest things about projects, missions, initiatives and activities is setting the definition of success. How do we know when we’ve been successful? Setting boundaries and conditions prevents mission creep. @Money Infant-Sounds like an exciting and stimulating lifestyle. I vote with success! @101- That is such a smart question. You really must define success for oneself, or you’ll always flounder. Do I think money is the only true measure of success? Absolutely not. It is one measure of success, but not the only one. If people earn a lot of money, but they treat others badly or they don’t have any positive relationships or they aren’t feeling a sense of satisfaction with their work, then I don’t think those people are truly successful. To take it to the extreme, look at some of today’s superstars. They make tons of money, but their lives are an absolute mess. They can’t maintain stable relationships, they have a totally inflated sense of themselves, and they often turn to drugs or alcohol to cope. I don’t consider these people very successful because their lives are falling apart. I think having a great deal of money is wonderful because it allows someone to have the freedom to do what is important to them without worrying about how to pay the bills. When people do what is important to them and they derive a sense of satisfaction from it, then I think they are a success. @RevDella-Bringing the examples of the stars is a perfect example of having money and lacking the basic life and success skills. In spite of all of the media attention, it’s so important to remain grounded in your own version of success. Sounds like you do that well. I’m sure you have heard of Abraham Maslov’s hierarchy of needs. You are talking about the highest level in his hierarchy – self actualization. He thought that before you could get to that 5th level to satisfy the need to be successful, you had to move through the other four: Physiological, security, social and esteem. I think our definition of success changes as we move through these levels. This is a timely post as I am struggling with this conflict myself. More work means more money and more financial security, but that is also less time I can spend with my kids while they are little. . . I think I feel successful because of my failures. I know it may sound odd, but if I hadn’t been such an idiot both personally and financially in my early years I don’t know if I would truly appreciate the life that I have today. I measure my success in time I get to spend with my husband, forward progress on the goals we share, puppy tail wags and kitten cuddles. It’s a rough life but someone has to do it! You may want to add one more to your list — building genuine relationships. After reading your article on Yakezie few weeks ago, I was inspired to write about my scorecard of success and failure. By far, building great friendship and lasting relations have contributed significantly to success in my life. @Marie-Wow, what a literate answer… haven’t thought much about Maslow since my Masters degree studies last century. Thanks for adding a totally new spin to the discussion. @Melissa, I wish it could say the discussion gets easier. My kid is grown and I’m still struggling with the same questions. I don’t regret taking time off when I was younger to be almost a full time mom! I think life experience is in the struggle. @Shilpan-You made my day… I feel honored to have inspired you. In the end, you have nothing if not relationships. You can’t call a dollar bill up to chat! For most people in our modern-capitalism world, money is the first thing, and sometimes the only thing that measures success in their life. Money can buy power. Money can buy fame. Money can make the world go round. But money cant buy everything. Being successful is not about money. For me, when I reach my goal or when I accomplish my purpose, then I can consider myself successful. @Patrica and Ann-It’s so important to quantify what you value and use that as your own personal metric. Money in and of itself is only useful as a currency, not an absolute. @Vincent, I’m so glad you brought this up. Service to others is beneficial for those we serve and even more so for ourselves. I have a trick that whenever I’m feeling down or sorry for myself, I try to reach out and do something for someone else. I really appreciate the comment. I think success is determined by how one is able to balance between what they want and what they should give. Spending time with your children instead of making more money is a good thing. Deep inside our hearts we always know what others require of us. We know when to be of service to others but sometimes we just choose to ignore them because we have to spend more time working on our goals – goals that can generate more cash. So everybody makes their choice, and yes we don’t have to judge them before we judge ourselves. @Philos, You encapsulated 2 really important point, how you spend your time demonstrates what you value as well as the balance between giving and taking. I especially appreciate your your reminder not to judge others. That one cannot be emphasized enough!!! Thank you so much for your contribution. I don’t know that there is only one measure of success. When somebody refers to another person as being “successful” though, they are usually referring to financial success. Society certainly sees money being the measure of success. @Daisy, Agreed, society places success and money in the same category. I try to separate out the two. There are lots of rich people with nothing else going for them! When I think of success, money is not even a factor. I think of success as doing what you set out to do. @Jules, I love that comment. So important to measure success by your own standards. No money is not the only indicator of success and to some people it doesn’t even show up on the radar. In this day and age, though, these people are few and far between. Societal factors and pressing economic stressors all but force the majority of us to place emphasis on the value of the oft glamorized greenback. With focus and a steady mind, it IS possible to juggle all of the other measures of success successfully. You spoke of this in the post and am glad that you did. Despite the theme of this blog I applaud the fact that you have shifted the tone for just this moment to make mention of the other things in life that I feel should most, if not all, of the time take precedence over money. I think being able to live your life the way you want to live is the definition of success. I want to be Financially Independent and be able to leave the cubicle but I’m not there yet, so by that definition I’m not successful. But on other fronts I’ve done a lot of good things that I am proud of and was very successful at. All depends what you choose to classify as success. @Michael, Money solves money problems, but is not the solution or key to a fulfilling life. It would be way too simplistic to suggest that. @The potatoehead- Thanks for the reminder that success is self determined. Don’t fall into the trap of letting others define success for you. No, it’s not all about the money. There are a lot of factors and although it might not be at the bottom of the list, there are far more important things in life than that. @KC, I’m keenly aware that in this country most of us have so much wealth, (even the poor) in terms of access to healthcare, relatively safe streets, and freedom. Friends and family take time to cultivate, but are also free. Thanks for pointing out again what’s really important.